The list of things I’ve learnt over the weeks since Ella arrived is almost endless. A surprising amount of these things relate to beauty routines. One of which being that keeping things simple is the way forward – time is key, so why use three products when I can use one? Also, having a baby means DRY HANDS. I mean, I have dry hands as normal anyway – but throw in the extra hand washing sessions and my hands resembled the sahara before Ella turned a week old. So bringing in the big guns when it comes to a moisturiser than I can slather on and trust that it works. Bonus points for something that’s a multi-tasker too. Not that I ask too much of a single product. But if it’s one I can apply as a simple hand cream, or I can slather on and stick some cotton gloves or socks over whilst I sleep and use as a more intense mask. Added plus that if I can use any excess on my arms or legs – sort of doubling up my arms or legs. Meaning not needing to reach for that extra product. In general since having Ella I’ve felt my skin all over be even more dry than usual. 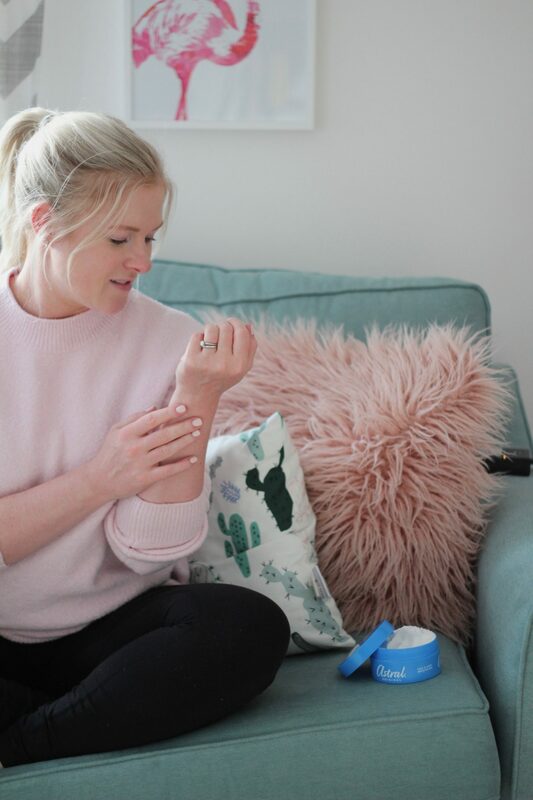 In reality I think it’s back to my ‘normal’ – I think pregnancy treated me kindly when it comes to my skin and it was actually more balanced and hydrated than usual for that nine months. But now it feels SO dry I need something that works. A classic product is a classic for a reason – if it didn’t work, then it wouldn’t sill be such a classic that’s trusted by so many. Especially when you look at a beauty market that has endless products to choose from. 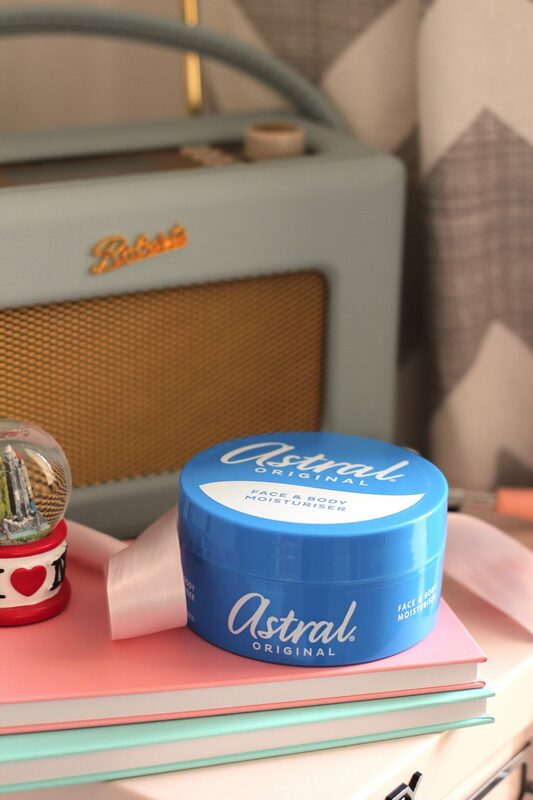 For there to be one that’s been around since the 1950’s – Astral has that classic vintage style packaging with it’s signature blue pot being instantly recognisable. Plus there’s the NEW Cocoa version. There’s something so satisfying about scooping out the product from the pot – with an affordable price meaning I can slather it on as I need to without hesitation. 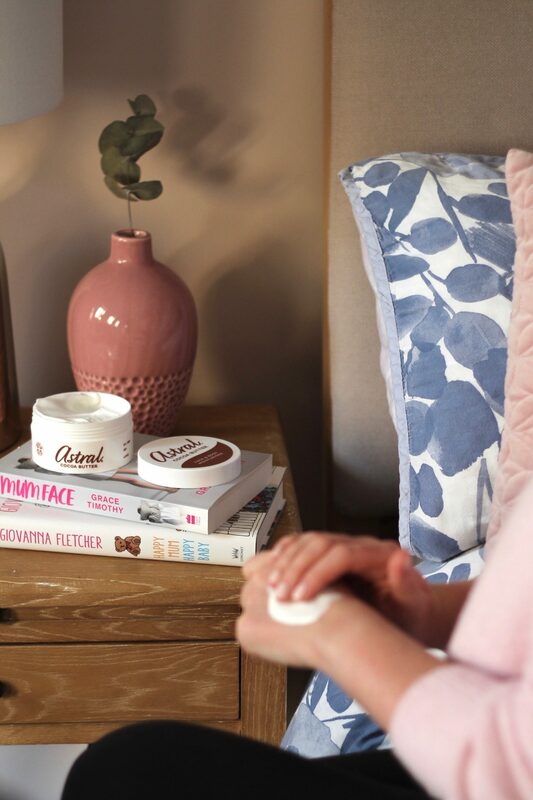 For my hands in particular the formula is ideal as it contains lanolin which is a rich natural waterproofing wax that helps create a protective barrier and prevents skin losing moisture. Really helping my hands stay hydrated through the constant cycle of hand washing. 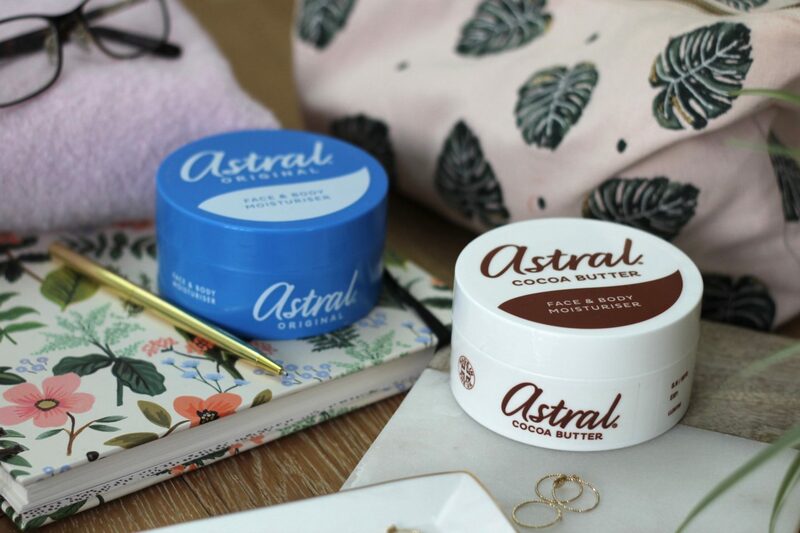 Personally I love the clean/powdery scent of the Astral original version, but the new Cocoa version has that creamy cocoa butter fragrance. Both variants soak into skin and leave it instantly hydrated and smooth. It also leaves a bit of a sheen on skin that will be lovely for Summer. Both creams are perfect if you’re still maybe sloughing off that Winter skin and want to get ready to get your legs out for the warmer months as they’re rich and creamy enough to take you from parched to hydrated in super speedy time. Speedy products being my current favourite. Basically, it’s a classic for very good reason. A thick and creamy pot of moisturising goodness with multiple uses from head to toe. My personal favourite has to be the intense moisture it gives both my hands and feet. My most recent ‘new’ use is for my elbows and knees that feel like they need a bit of extra TLC. 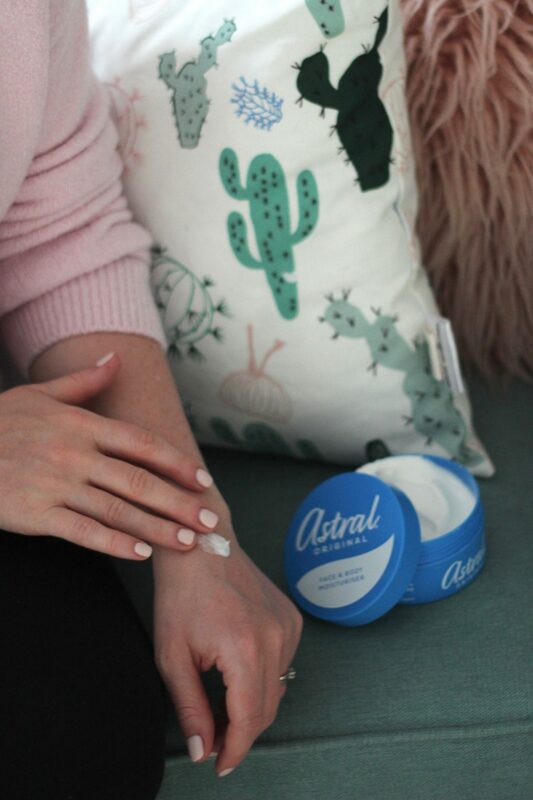 If you want to find out for yourself why Astral is such a classic staple beauty product with many, many, uses then head over to my Instagram where I’m giving away ONE HUNDRED samples.Yes really, one-zero-zero ONE HUNDRED. So there’s some pretty good odds you could get your hands on your own classic blue pot and see how you might put it to work yourself. All you need to do is head over to my Instagram post and leave a comment sharing your best beauty tip in order to win one of the hundred pots I’m giving money. 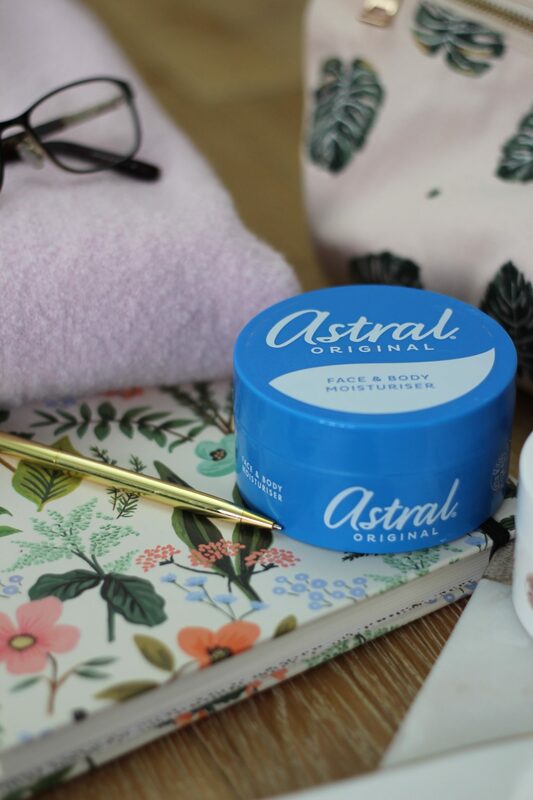 tips/comments received will receive a FREE 50ml pot of ASTRAL Original Face &amp; Body Moisturiser worth £1.29 RRP. Closing date is 23.59 on 30 June 2018. Entry is open to UK and ROI residents aged 18 years and over. Only one entry per person will be considered. No purchase is necessary. 4. To enter, simply submit your personal best beauty tip or piece of beauty advice as a comment to Beauty Junkie London’s ASTRAL “Beauty 1-0-One” Instagram post. 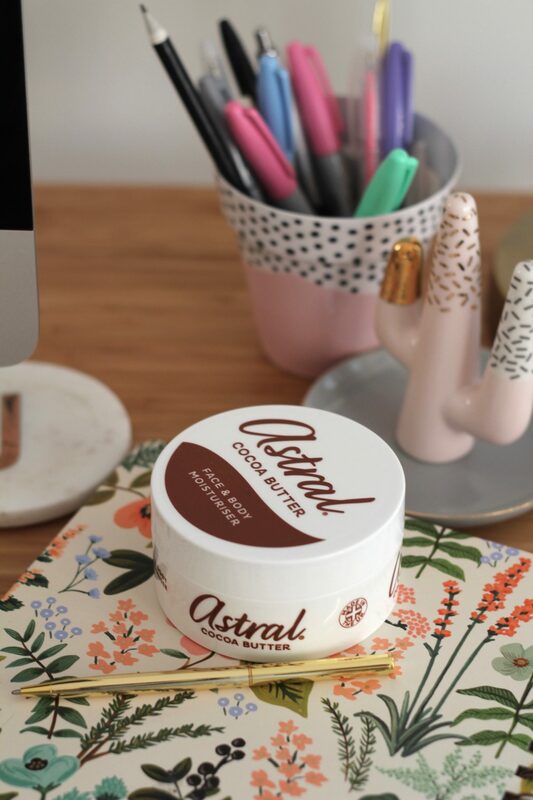 The first 100 tips/comments received will receive a FREE 50ml pot of ASTRAL Original Face & Body Moisturiser worth £1.29 RRP. Closing date is 23.59 on 30 June 2018. 6. 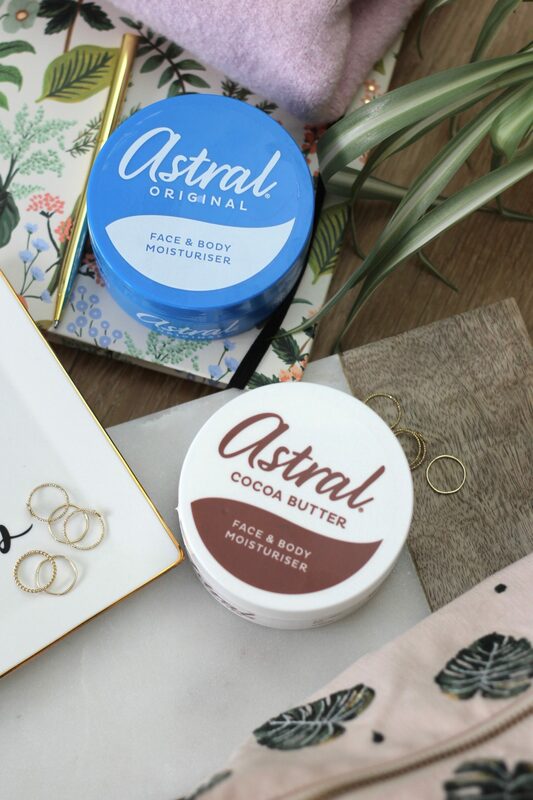 The first 100 valid entries received by 23.59 on 30 June 2018 will receive a FREE 50ml pot of ASTRAL Original Face &amp; Body Moisturiser worth £1.29 RRP. 8. Winners will be notified by direct message within 14 days of the promotion closing date. 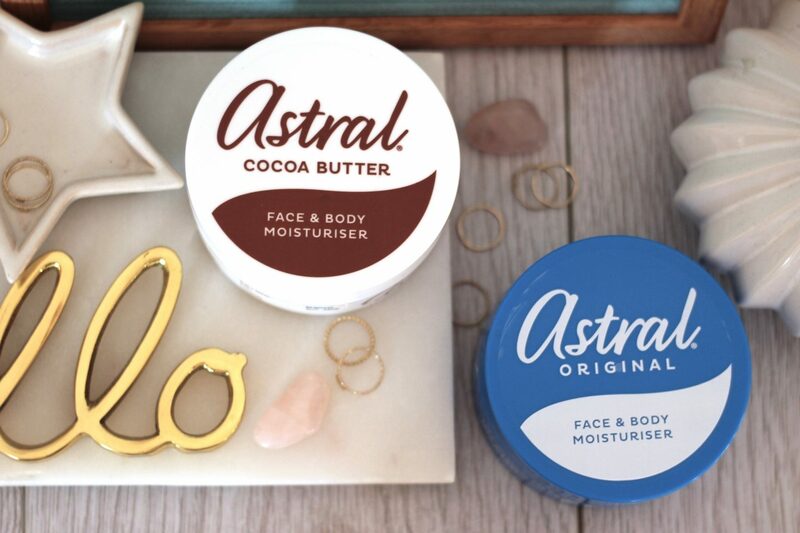 To claim the prize the winners must email their name, address (including postcode) and Instagram handle used to enter the promotion to Olivia.parr@ketchum.com and state “ASTRAL Beauty 1-0-One/Beauty Junkie London” in the subject line. In the event the claim for a prize is not received by the Promoter within 14 days of notification, the Promoter reserves the right to select an alternative winner. 14. By entering the competition, the winner consents to their name, Instagram handle and beauty tip being used in the resulting ASTRAL “Beauty 1-0-One” materials and outreach, and in any publicity generated as a result of the competition and to images and text entry being used for publicity or promotional purposes including, and not limited to; Instagram,websites, magazine or mobile services at any time without further consent or payment.